The Chiefs and people of the Nkoranza Traditional Area have kicked against moves to name Techiman as the capital of the newly-created Bono East Region. According to the Chiefs, Nkoranza has a lot of advantages including its central location and close proximity to almost all towns in the new region than Techiman which is being favoured because of its home ties to Deputy Minister for Regional Reorganisation and Development, Martin Adjei Mensah Korsah. 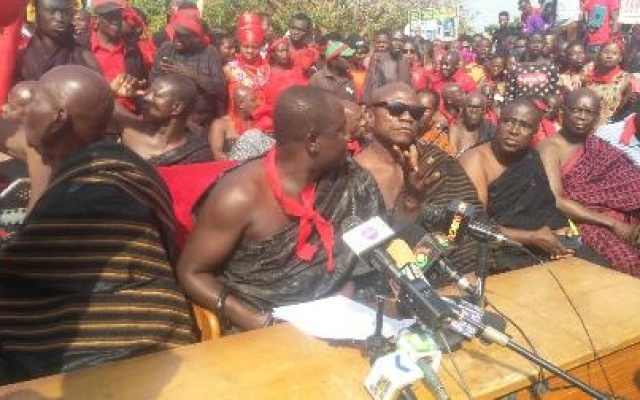 With barely 24 hours to be handed Constitutional Instruments to give legal backing to the new regions, the Chiefs at a press briefing earlier on Monday, 11 February 2019, accused the government of excluding Nkoranza from a meeting with traditional leaders and District Chief Executives at Techiman on Thursday. The Chief of Buaben, Nana Owusu Damoah Ameyaw III, who addressed the press conference on behalf of the Nkoranza Traditional Council said they perceive a well-orchestrated plan to sideline Nkoranza in the naming of a regional capital. But the government believes such agitations and their demands are needless. Deputy Regional Reorganisation Minister, Martin Adjei Mensah Korsah thus has appealed for calm and assured that developmental projects will not be centralised in the various regional capitals alone.